If you are considering buying a used RV there are certain things that you should be aware of. It can be a wonderful investment if you are a savvy shopper and know what to look for and how to navigate the process of buying a motor home. Recreational vehicles are becoming increasingly popular with more and more families and individuals because of their comfort and versatility. Buying a used RV is a way to get into a recreational vehicle at a lower price and hopefully with a great value. There are three basic steps that you need to take in order to find your perfect motor home whether it be a travel trailer, toy hauler, or motor coach-first, you need to have an idea of what you want and how much you are willing to spend; second, you need to find a good dealer; finally, you need to get the best financing available for your used RV. First, what kind of motor home are you looking for? There are towable recreational vehicles and motorized. Towable motor homes are generally smaller and more compact, although on many models you will find “slide-outs” that can increase the living space when you are parked. Some, like the toy hauler, are equipped to carry ATVs and motorcycles inside. Virtually every used RV has at least a small sleeping area and some have small kitchen, bathroom, and seating areas as well. The motorized motor homes are bigger and have more space and features-they are generally more expensive, but you can get a smaller motorized motor home for about the same as a top-of –the-line towable motor home. Prices range all the way from about the cost of a nice SUV, up to the cost of a nice home. You can estimate how much you can afford in a used RV by using an online motor home calculator which will estimate your monthly payments based on the cost of the used RV, the length of financing, and the interest rate. Second, you need to find a good dealer–A dealer who offers the best quality products at the lowest prices. At PedataRVCenter.com you will find a motor home wholesaler who not only offers brand new Holiday Ramblers at extremely low prices, but you may also find the used RV of your dreams there as well. Take a look at the new models because you may find that at a wholesale price it is similar to what other dealers sell their pre-owned models for. At Pedata, they have information on motor home types and manufacturers as well as financing information and tips for the best places to stay and camp. It is a one stop motor home shop. 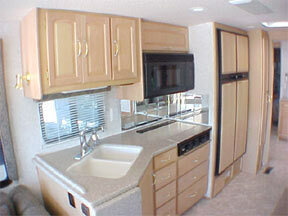 Third, you want to get the best financing for your used motor home as possible. There are specialized loan products that are designed specifically for motor home buyers that you will not find at a bank, credit union, or other traditional lender. These products have the specific needs of motor home buyers in mind. On Pedata’s site you can be pre-approved for your new or used RV loan which will make the rest of the buying process run much more smoothly. Once you have chosen your perfect recreational vehicle you will simply have to finalize the financing and you will be ready to hit the road. 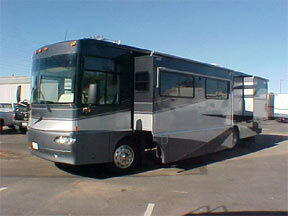 With an investment as big and important as a motor home you owe it to yourself to make savvy financial decisions. A good dealer can help you to make those decisions with confidence and comfort. You will have the support of the dealer before, during, and after the sale, and you will be able to relax and enjoy the lifestyle that a recreational vehicle affords you.